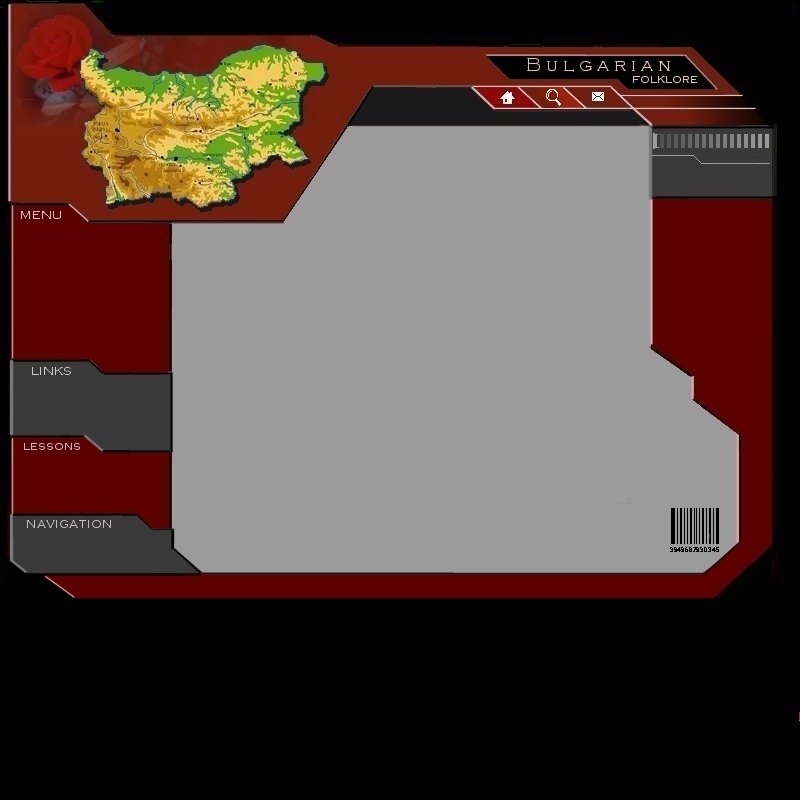 ulgaria is a European country situated in the middle of the Balkan Peninsula / South-Eastern Europe/. The state was founded in the end of VIIth century and included three main groups of tribes - thrako-iliri (the oldest one), proto-Bulgarians and Slavs, who came from Northwest. Gradually folk music that carries the characteristics of these three groups was formed. This is the reason for the variety of folk songs and instrumental melodies. Every region in Bulgaria has its own folk music. 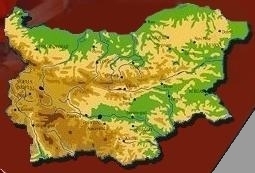 These are the folk music regions - Thrace, Pirin, Shopluk, Rhodopies and North Bulgaria. Even today village people sing olden folk songs about the peasant’s labour; ritual songs - for wedding, carols, Eastern songs, old Lazar’s songs and many others. Bulgarians use to play the ancient folk instruments - strings: rebec, pandore; wind: kaval, wooden pipe, shepherd’s pipe; percussions - drums and others. It is particularly typical for Bulgarian music having a tremendous fund of songs and instrumental melodies constructed in asymmetric measures - from 5/16 till 8/16 in hundreds of varieties and combinations. Bulgarian musicians are the first who find these measures and present them into the theory of the world music in the beginning of XXth century. Bella Bartok, the famous Hungarian musicologist and composer, called them "Bulgarian measures" in 1929. Bulgarians are born and die with music. Special songs are sung when a child is born; at wedding - a number of songs for different moments of the ceremony, that lasts for several days; and when he dies - they weep him over with special funeral laments till the 40th day of his death. Women’s shops’ songs are incredibly poetic and full of lyrics. They are absolutely contrast with the rough shops’ character, with strong "dissonant" two-parts singing that singers perform their old ritual, labour, dance, tragic and joyful folk songs with. Women use to sing their two-part songs in two groups - the first group begins, the second one finishes and they continue in that way until the whole text is over. One singer in the group sings the first part - she "leads", another two or three or more sing the second part they " trail". The second part "fights" constantly the first one - it always seeks for the sharp interval "second" for receiving more intensive sound. Men do not sing in two voices. They sing one-part melodies, famous old Bulgarian epic songs about stories from the history of people, about legend heroes - fighters against five hundred Turkish yoke - Krali Marko, Momchil the leader etc.These songs have very large texts - 400 -500 verses and usually their performance lasts for several hours. They sing these songs at the table when listeners have the time and the mood to listen. Usually these epic songs are accompanied by rebec. Shops’ folk dances also don’t have an equivalent. These are the most brisk, temperament and dizzy dances that could be seen in the whole Balkan Peninsula. They start in slow tempo. Little by little the tempo grows up and soon it reaches the maximum of rapidity and frequency of steps. Dancers cry out "Hold on, Earth, shop is treading on you" ... and it seems as if they fly out. If one wants to understand the music accompanying these primary dances he would be not only well-trained theoretic musician but a mathematician as well because these are asymmetric measures from 5/16, 7/16, 11/16, 13/16 till 1/16 - incredible treasure and music wit! The shops around Sofia sing an old song of theirs that says - "There is nothing high but Vitosha". Vitosha is the mountain of Sofia and the Shops around. That is their "humble" self-evaluation - there is no more clever, better, more beautiful and talented people but them. The folk music of Western Bulgaria includes the whole theme diversity of Bulgarian folk songs. This is the area situated between the Balkan and the Pirin Mountains, reaching Yugoslavia in the west and bordering on the Thracian folklore area in the east. As regards to their desposition, temper, dialect and to a large extent customs the Shope people, who inhabit the area, differ considerably from the Thracians. Their musical folklore diverges from the folklore of the other neighbouring areas too. The hot-tempered, facetious and resourceful Shope people have created a folk music, which corresponds to these qualities. Particularly specific for the area is the two-part style of singing with the unique parallel second. As if singers attempt to obtain second even when they could avoid them - the second, which is the lower voice follows the basic melody, which is of a narrow tone range. The two-part Shope songs have a interesting sounding, somehow sharp and even piercing. These songs embody almost all genres - old working-bees, table songs and especially the harvest songs which could be one or two-part. The one-part songs are more varied, often with high exclamations in the end of the melody. The frugality in the two-part style seems to be compensated in the other type of songs - the recitative ones. They are one-part, unrestricted, starting with a richly embellished exclamation, to get the listener ready, followed by descending of the tone. The song usually finishes with exclamations similar to those at the beginning. In this stereotyped melody hundreds of old-time heroic and historical songs are sung, called by the people "Krali Marco's" or "matchmaking" songs. Most of the two-part songs are the local harvest solo songs, which are performed antiphonally with overtapping. Now you will hear the song "Oi, Shope, Shope"
The local two-part songs are performed solely by women, who sing loudly and openly. It is very specific for the one-part songs, as well as for the two-part harvest songs to be performed in a typical "feverish" manner, which is attained by abrupt changes of the tone. Here we can find old-time monorhythmic horo songs in 2/4 beat. In the Shope folklore area the irregular beats are used in songs of different kind. The further east we move towards Pazardjik, Ihtiman and the Sredna Gora region, the greater their variety becomes. The interesting 10/16 beat, a modification of the 11/16 beat, is present in an old local horo danced here. There is also found the oriental combination 7/16 + 11/16 in the traditional Shope horos "Sedi Donka na Djukenche" and "Jova's" song. A distinguish feature of the Shope dances is the movement known under the name natrisane (quivering of the body upwards of the waist and especially of the shoulders) as well as the sharpness, with which they are performed. The basic movements are small and concentrated in the legs, while the actual movements are high, wide and with the other parts of the body taking part in them. The Shope people dance highly, lively, as if they don't touch the ground. Men's dances often are accompanied by vigorous exclamations "ha-a-a", "i-i-i" or by growling or speaking, which emphasize some difficult dance combination. Wide spread are the chain horos and the horos with the arm hold na lesa. The Shope dances are based on the greatest variety of complex rhythms: "Small-stepped Men's Horo" in 2/4 beat, "Chetvorno" in 7/16 beat, "Jove" in 7/16 + 11/16 beat, "Lile, Lile" in 9/16 beat, "Dilmano, Dilbero" in 8/16 beat and others. orth Bulgaria region includes the lands between Danube river to the North and Balkan mountain to the South. These are ancient Mizia lands. The population in the western part is a local one, while in the middle and especially in the eastern part it is mixed with settlers from Eastern Thrace. They have settled here after the liberation from Turkish yoke /1878/. This mixture of Bulgarians from different regions reflects in the music as well. North Western Bulgaria has olden songs and instrumental folk music. Primitive ritual melodies - for wedding, at dry etc. are preserved here. They sound strange to the modern ear - they are built only of one or two tones, and have thrifty rhythmic. Labour’s songs - harvesters’, shepherds’ etc. also carry the primeval characteristics when the song had been a symbol - it had impact upon the Nature. These sons are attended by exclamations on high pitches and are performed mostly by two solo singers - one of them begins and the other one responds. In the near past hundred dance songs had been sung at the great square horo-dance in the village center or at small dances far from the central parts, in hamlets. Nowhere but in northwestern Bulgaria we find the wealthiest collection of folk dances, accompanied by musical instruments. The violins have entered in here early as well as the brass- winds. They play the old-time local rich asymmetric rhythms together with assimilated from the neighbours melodies - Serbs in the West and Vlachs in the North. Therefor the folk music and especially dances of this region have many varieties, with very complicated steps and figures, temperament and brisk. It is old style here the violinist to play and dance himself. The other players follow him, but he is the great master! Going to the East the horo dances calm down gradually. The tempo gets slower, asymmetric measures remain mostly 5/16 and 7/8 ("Rachenitza Rhythm") and rarely 9/8. The song is calmer, exclamations on high pitches disappear. In return for it the number of instruments gets more. Every village has its own famous kaval-, pipe- or rebec players who play the old melodies. Melodies of the ancient local population - kapans, grebens, erls and others are particularly interesting. These players also form their own small orchestras in which they combine the three main Bulgarian folk instruments - kaval, pipe, rebec and drum. The Northeastern part is Dobrudja region - unendless valley, the most fertile one of grains in Bulgaria. Here three musical styles meet together: music of the ancient local population, situated mainly along the Danube river, around Silistra and Tutrakan, big groups settlers from Thrace- Southeastern Bulgaria, as well as people from the mountains from central Balkan that had come here in the middle of the XIXth century and later. These three groups inhabitants have given the best of their own folklore and a new original, "Dobrudjanski" style was formed. Dobrudjan dance melodies, performed by their famous players, could be found only here and they are performed in a peculiar, specific style. The musicians were born with it. Here the mouthorgan is also well known. It has been brought from Besarab where thousands Bulgarians had moved during the Turkish yoke. The only Bulgarian chamber formation - so called "Dobrudja Trojka" consists of mouthorgan, small rebec and pipe. Like the Dobrudja folklore area here the music folklore is a mixture of different styles, influenced by the neighbouring districts, because of the migration of large number of people before the Liberation in 1878. Being afraid of the Turkish brigands, who after the decline of the Ottoman Empire increased in number, many Bulgarians escaped in the mountains. So the population of the Danube Plain beared down on the Balkan Mountains. After the Liberation local people moved back to the Plain and together with them came many settlers from Thrace. The mixing of the population determined the mixing of the musical styles. Nevertheless, if we closely examine the styles, we could see some features typical of the Northerners' musical style like for instance some pentatonic songs unusual for other areas, old-time wedding songs or harvest songs with original exclamations. There is a certain resemblance between the Northerners and theThracian musical folklore, a striking example of which are the kapantsi in the Razgrad county, the erliitsi in the Novi Pazar county, the hurtsoitsi in the Rousse county, the turlatsi in the Belogradchik county. he Dorbrudja folklore district is situated in the northeast part of Bulgaria. It is surrounded by the Danube river in the north, by Black Sea in the east and by the North folklore area in the west. It characterizes by rich and varied music folklore. During the Liberation of Bulgaria in 1878 large groups of the Thracian population, as well as from the Balkan Mountains moved to the Dobrudja region. There are two musical styles in Dobrudja - the Thracian one and that of the mountain-dwellers, which gradually join the depths of the ancient local traditions. Along with the Thracian and mountain-dwellers songs, there are heard richly embellished, unmeasured harvest, table and working-bees' songs. The Dobrudja slow song is sung equally by men and women. Here, unlike many other regions, women usually sing in a higher register and closed. There has been created a new style in folk music, characteristic only for the Dobrudja region, which is performed by rebec, shepherd's pipe and bagpipe. Partcularly well-known are the Dobrudja dance melodies ruki, sboreni, ruchenitsa and others. It will be no exaggeration of we say that an interesting instrumental school is in process of forming here, as a result of the linking together of the two styles already mentioned. The influence of the neighbouring Romanian folklore should not be underestimated, which on one side takes elements from Bulgarian folklore (some irregular beats) and on other gives the Bulgarian folk music certain ways of performing. 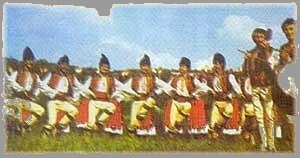 The Dobrudja dances are distinguished with their own style, which is notable for the high-spirited performance, free of stiffness movements and taking part in the dance of arms and shoulders. They are danced at a moderate tempo, with squattings and a slightly bent backwards body. 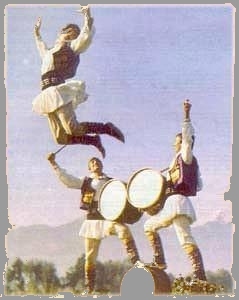 The Dobrudja horos are performed in a semi-circle or straight ruchenitsa. Men usually dance in a straight line but when horos are mixed they are performed in a circle or semi-circle. The Dobrudjan man likes dancing solo, for example the ruchenik has such an ensemble performance, as if everyone is a soloist. Most widely spread are the mixed horos and less are men's. Famous horos are "Sboreniya", "Ruka", "Buenets", "Danets" in a 2/4 beat, "Paidushko" in a 5/8 beat, as well as "Ruchenik", "Sei, Sei Bob", "Brusni Tsurvul" and others. Very interesting dances are "Izhvurli Kondak" in a 9/16 beat, "Cherkezkata" and "Trunkata" in a 13/16. hrace is the biggest folk music region in Bulgaria. It is situated to the East - from Pazardjic field till Black Sea coast – South Bulgaria. Long ago famous folk singers, players and dancers have spread its fame in the whole Bulgaria and abroad. own style. Dance songs are countless – the Thrace "pravo horo" is an unending one. People dance it in hours; they wind it on the large horo-places and the tireless women sing song after song.The ritual songs for wedding, go caroling, songs at Lazar’s day, St. George’s Day, Enio’s day etc. are the connection with the deep old ages. The cradle of the ancient Thracs is here! Men are masters in singing table songs – wedding ones or at meetings. These songs are serious, slow, recitative songs that tell about old-time stories or new ones – since the war in 1913 when the population was too close to events about conquering Odrin - the armies passed these places on its way to and back the Western border. But the songs for "Hajduti" – fighters for liberty from Turkish yoke – who were especially active in XVII and XVIII century, take central place in men’s repertoire. Only men play the folk music instruments. Here in Thrace we can find all kinds of Bulgarian folk music instruments- kaval, pipe, small pandore, all kinds of winds and percussions. Famous Thrace players put the beginning of the new type of Bulgarian folk orchestra. Composers as Fillip Kutev, Krassimir Kjurkchijsky, Kosta Kolev made arrangements of folk music especially for these new formations. Western Thrace is rich with asymmetric measures but going East these measures diminish and remain only in dance melodies like 2/4 and 7/8. More complicated measures as 9/8 and 13/16 are rarely found. In the southeastern part is situated Strandja. Its music has connection with the Thrace folklore but it also has its own local colour. The old-time ritual melodies are richer in their asymmetric measures. Lasses’ spring songs, accompanying the calm lasses’ dances during the Long Lent when the big horo dance in not allowed, are especially beautiful. The ancient ritual "fire-dancing" – dancing on the live coals during St. Constantin and Elena celebration has been preserved in Strandja. The greatest Bulgarian kaval players – Nikola Gantchev, Stoyan Velichkov, many pipe and rebec players were also born there. Thrace and	Strandja folk music was the touchstone in creating the new type of arrangements of folk music. The composer from Thrace Fuillip Kutev created this style in the beginning of 50es. The Thracian coval style has influenced an enormous part of North Bulgaria, because whole villages from Thrace migrated there particularly the Bulgaria's Liberation in 1878. The Thrace region characterizes with one-part style in singing and richly ornamented slow songs. Women sing openly, loudly and naturally. The range of the female voice is narrow with a ninth or a tenth. Song are sung mainly by women and their repertoire is rather diverse - from ritual to epic songs. The melodic structure of Thracian songs stands close to those of other areas - with gradual movement (except the carob songs). The tone range is narrow - up to the fourth or fifth, with predominating minor or Phrygian tetrachord, typical of the ritual, horo and harvest songs. The table and the working-bee songs have been noted to have a wider tone range. In their melodic development they have reached the eight or ninth and even wider tonal range. The slow Thracian songs have often a two-mode structure - the first melodic series forms one mode, the second series - another one. The Thracian folk song lack in irregular beats. 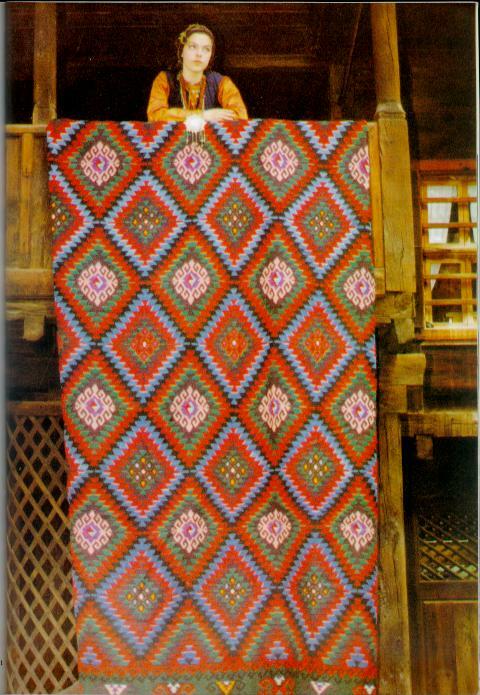 In the areas where traditions are still preserved, the local folk songs are two types - in 2/4 beat,characteristic of horo and ritual songs and the second kind are slow, unmeasured table and working-bee songs. Many songs of the second type became masterpiece of Bulgarian vocal folklore with their exquisite lyrics, richly embellished melody and tender sounds. In some places in Thrace along with the 2/4 measured songs, there are others, which have the beat of the Paidushko horo (5/8, 5/16) and ruchenitsa (7/8). This shows the depths from which the Thracian song had blossomed out as a continuer of the ancient Thracian style. The Thracian Christmas is generally celebrted holiday and the songs, connected with it, are extremely poetic, of various themes, structures and melodies. Here the carol song is lively, cheerful, with sharp melody, always in "guisto" tempo, with frequent descending and ascending movements or the fourth and fifth. The Thracian folklore area is very diverse with regards to the genre. Except winter songs there are also sung others, related with spring customs. Particular place take the lyric series of songs, called "na filek" some of which have the uncommon 8/8 beat. St Lazar's Day songs are widely spread spring songs which in some districts are given the name "na peperuda" (a butterfly). The shepherd's pipe (kaval in Bulgarian) is an inseparable companion of the Thracian peasant, which is proved by its great influence upon Thracian songs. Many ornaments used in slow songs have been literally drawn on from shepherd's pipe melodies. There's a saying here which goes "She is singing as a pipe is playing". Even some specific intonational features of the pipe such as the "chopping" (a kind of repetition of a tone, obtained by lightly tapping the finger over the hole) have been reflected in men's and women's style of singing. It happens very often that the shepherd's pipe as if "completed singing" the vocal melody of the song. That is why most of the shepherd's pipe melodies are in fact melodies of famous folk songs. Except the "favourite" instrument - kaval or shepherd's pipe there are met other typical Thracian instruments like for example the bagpipe "djura" and less often the rebec. The Thracian instrumental style is unique with its richly embellished slow melodies, which have segmental melodious lines, called kolena. The kolena often have similar modes or they alternate with each other in different modes - first the minor, follow by the major and then with and augmented second (hiatos) between the 2nd and 3rd degrees of the mode. That way the shepherd's pipe horo melodies has grown into interesting, logically developed multi-parted composition. 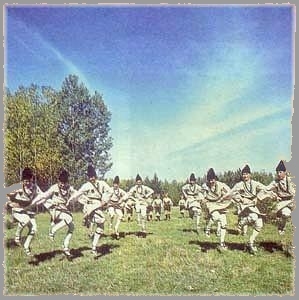 The Thracian dances are jovial and exuberant. Some places in this vast area are greatly influenced by the neighbouring districts. That is the reason why there are found dances characteristic of other regions. For instance the Western Thracian horos are affected by the Shope and Pirin dances of the type of "crooked" horos, base on a 11/16 beat. More famous are the "Glavanishka" Kopanitsa and "Vetrenishka" Kopanitsa. The Eastern Thracian horos are danced with typical small-stepped tapping on the ground, known under the name of "tropoli" and are performed only by men. They dance gracefully, solemnly and usually the beat is 2/4, 5/8, 7/8, and 9/8. Other horos typical of Thrace are "Trite Pute" (The Three Times) and "Kasumska Ruchenitsa", also danced to a 2/4 beat. Although the Strandja district falls under the Thracian folklore area, it has its own features in singing and dancing. The Strandja Mountains begin south of the Bay of Bourgas, spreads between the Black Sea and the Deventski heights and reaches the Turkish village of Strandja. The Strandja horos take a particular place among the Eastern Thracian dances with their specificity and original style. Most of these horos have ritual character - the fire-dances are mystical dances over a fire. Similar character have the Easter ruchenitsa, the carnival plays - mummers and others. All over the Strandja district is famous the genuine, youth spring party "Filek" which characterizes with small steps on the right. The Strandja horos are usually performed collectively and rarely individually when a competition in dancing is organized. They are performed in a semi-circle or a line and accompanied by a singing and the music of bagpipe, shepherd's pipe, drum or other instruments. t is situated in the Southwest Bulgaria. Folk songs and instrumental music could be heard in every village, every town in that region. Here songs are sung in two voices and in two groups. The group consists mostly from three singers (women) - first one is singing the melody, the others - the second voice, which is usually lying on the Tonic. First group begins, the second - responds. The result is a beautiful, almost choir sound. Very often dissonant intervals are formed between first and second voice - small or large seconds. Such "harmony" is very unusual for untrained listener, but singers are very delighted of that sharp sound. "Like bells, " they say. This sound reminds them the bells ringing of the numerous flocks that graze on the fertile meadows, where Pirin, Belasitza and Ograjden Mountains surround every lowland. Songs accompanying the folk dances are particularly beautiful. Here the measure 7/16 with prolonged. This original measure has been underlined clearly and precisely by accompanying pandore, which tinkling cords measure seven beats of the melody like a clock. We find songs in that measure in all over Macedonia, Greece, Albania. This type of melodies lie in the structure of the new movement for contemporaring of folk music in Pirin region - so called Pirin folk - annual festival of the new Pirin song, which aim is to create new art in old Pirin style. It was very soon until the old rituals at wedding was performed in Pirin region. The wedding was attended with special songs for every moment sung by the friends of the bride. Also ritual songs for rain, at dry, rusalijski games etc were performed. Wondrous songs used to be sung at working-bees - slow, poetic, in two voices, sang by women and lasses with the specific for that region lyric intonation. During the last 30 years men also use to sing in two voices in many settlements in Pirin. The most typical instruments in Pirin are pandore and pipe. We find kavals in detached places. The rebec is unknown for the local players. 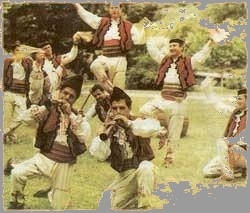 Small folk ensembles are popular in villages especially among Bulgarian Muslims - groups of singers (men or women) accompanied by two or three pandores, a pipe, shepherds’ pipe and a drum. This typical Pirin ensemble sounds marvelous and has unique timbre and mood. Every year, at Predela place, high in the mountain, people from Pirin organize it’s own meeting of traditional arts. It’s called "Pirin is singing". Thousands of folk singers, dancers and musicians from the whole region perform their repertoire during the two- days festival, with their typical temperament and admiration for the old-time testament by their ancestor only their own - Pirin style. Whoever has seen the beauty of the Pirin Mountain might have felt its music. Characteristic of the Pirin song is that it has a two-part style. Usually one woman sings the first voice and two, three or four other women sing the second even voice, called iso. Because of the little tone range of the songs sometimes the first voice lowers under the level of the second one. The melody is flowing, occasionally accompanied by the typical shouts. Some often used techniques for embellishing the songs are atsane (hiccuping) and tresene (trembling of the voice). A few women sit at a working-bee, throw glances at each other and suddenly start singing. The splendid melody sounds in two-part style, dearly and wonderfully, as if in all their lives they have rehearsed in order to make it so superb, original and unique in sound. The Pirin folk songs are varied in style, because there were great migrations in these areas in the past, mainly from Drama, Syar, Demirhisar, etc. Here we can find all kinds of songs characteristic of Bulgarian culture. Most favourable of work songs are the harvest songs, which are sung in the morning, at noon, at break, while coming back from the field and at harvest-time. Other preferred songs are those which are sung at working-bees, called "na sedeshki". They have diverse themes and melodies and are one of the genres preserved till nowadays. In this beat 7/8 (7/16) are also sung working-bee, table and wedding songs. In the Pirin area there are not often heard richly ornamented slow songs, typical for the neighbouring Rhodopes, Thrace and North Bulgaria. Singing in the Pirin district characterizes with harsh glides, hiccuping and trembling of the voice which make the slow song succinct. The old Pirin songs contaon the Pirin dialect - a Western Bulgarian vernacular having plenty of archaic words, interesting grammer forms and typical combinations of sounds. While the performers of the two-part songs in the region are mainly women, the instruments are played mostly by men. Widely spread are the tamboura and the bagpipe "djura", because both of them are two-part. Young men play the shepherd's whistle, called svorche. Characteristic of the area is the zourna (a kind of clarinet) in a combination with a drum. Pandore is a preferred instrument for setting up folk orchestra. During weddings or other celebrations there take part small, but fine-toned groups of two zournas and one drum - the first zourna plays the melody and the second plays the even tone - iso. The two-part melody is typical of the East Orthodox Church music. he mountain of ancient Orpheus - the Rhodopies, South Bulgaria, is the most differentiated as a region. Here the population sings unique in their musical and poetical structure folk songs and it has its own musical instruments and dances. During the Great migration of peoples, around VII century AD the Slavonic tribe "Smoleni" took here the central place and the main settlement in the mountain region now - Smolyan - inherited their name. In the Rhodopies region everybody sings - men, women, solo and together. Most of the melodies are constructed in the old mode Pentatonic. This ancient structure of the melody gives majestic sonority to the slow, rich ornamented songs. They tell about the heard shepherds’ life and the love sorrow of the lasses, who are waiting for them to come back from the White Sea region where they pasture their flocks during the winter time.Almost the whole population sings its songs in one voice. The songs are calm, even when they accompany the severe Phodopies’ horo. The up-land had never afforded opportunities for dancing a wildly horo - the horo place is small and sometimes - rather steep. During the XVII - XVIII century a part of the population has been forcibly converted to Mohammedanism. Bulgarian Muslims take the new religion but the language and the old songs remain unchanged. They even preserve lots of old-time forms that have been lost among Christian population. Among the Muslims we find miniature midget melodies constructed from two or three tones that lasses sing until nowadays at "mejo" - working-bee or "bajramsko horo". Unfortunately the new religion has forbidden the old Bulgarian ritual songs to be sung. The games of the Lazar’s day are forgotten, go caroling is not remembered, people have been prohibited to play the Rhodopy "caba" (big) pipe etc. In the past men used to sing their own, "men’s" songs, rich ornamented and free, while women used to sing others - "women’s" songs,, with more narrow tone capacity and week ornamentation. While I am going in it. The Rhodopy song is not so rich with Rhythmes - only measures as 2/4, 5/8, 7/8 and 9/8 are recognized but it doesn’t decrease the wealth and variety of the melodies and highly poetic texts. And the big Rhodopy pipe colours with its manly sound the endless pine forests of the great mountain. Swains play the pandores, the shepherds’ whistles. They don’t recognize other musical instruments. From here - the Rhodopy mountains -Valja Balkanska’s (folk singer) old song "Deljo hajdutin" flew into the Space together with the most worthwhile of the Human culture - the Beethoven’s Symphony, the Ainsthtein’s theory... To carry message into the far Future about the high culture that has been created onto the Earth planet. Listen to the Rhodope Mountains and you will hear a sea of songs. The Rhodope song is full-toned, endearing; free and wide like the mountain. The purest style is heard in the Central Rhodopes. The wondrous beautiful mountain is populated mainly with little villages and hamlets, where still are heard songs - pure, authentic and sincere, closely related with people`s life. Women sing fast closed. Their natural vocal abilities allow them to raise the tone especially the Bulgarian Mahometan women. As far as it concerns men there are dominating the low voices - bariton and bass. 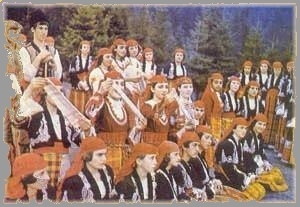 In the Rhodopes the folk song is sung equally by men and women. The archaic words exalt the originality of the songs and lend them extraordinary fasciriation. The most favourite stereotype verses which diversify the text are "Devoiko, Mari Hubava" (I say beautiful girl) "Malele, Moya Maichitse"(My dear mummy), etc. The songs meanwhile the working-bee dominate but as long as they are performed mainly by young people, they usually have love theme. Typical of other region's songs are near extinction hear in the Rhodopes. For example there are not sung carol and St. Lazarus's Day songs as well as harvest songs, because farming is not means of living in this region and Mohammedan women are forbidden to sing on the field. There are still preserved the wedding songs which took a special place in the wedding ritual in the recent past. Widey spread are gurbet songs (gurbet means going abroad to make a living). Which are two kinds of departuring and of coming back. These songs poetically express the sadness of people going abroad. Close to this genre are the shepherd`s songs, symbolizing the essential means of living of the Rhodope people. The songs convey the affection of the Shepherd towards his flock, towards "ovena vakal kamaten" (a splotch - faced ram), towards "parvo libe" (first love) and towards the house. The melody is flowing, but sometimes the intonation becomes uneven and every raise of the tone is compensated with lowering. There is not a variety of beats and the songs usually have 2/4 beats. Most of the songs don`t have definite beats, they are slow and sung by a solos or a band of singers. The instruments characteristic of the Rhodope Mountains are not so many - bagpipe (kaba), pandore, shepherd's pipe. The most widely spread instrument in the region is the typical of the Rhodopes "kaba" or low bagpipe, which is greater in size than "djura" or high bagpipe, it has a linger drone which gives out low and long tone. There is also "kaba" bagpipe with two drones, which is used for playing all kinds of melodies. Except the bagpipe the mountain constantly echos with the copper shepherd's bells, called chanove, whose ringing resembles the delicate melody of the Rhodope tambura. The Rhodope horos are danced gracefully, widely and with emphasized steady steps. 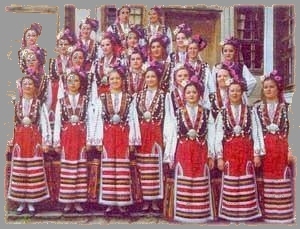 Squatings and kneelings are important part of dances and especially of the slow straight Rhodope horos, very often accompanied with high shout. While some of the men and women are singing, the others are dancing. Men dance freely, with wide steps, while women dance in a circle, dung close each other.